Jurassic World Came out this past weekend! In its honor we will be reviewing a dinosaur that has been requested over and over again but I insisted on holding off on especially when I knew Jurassic Park was going to get a fourth movie installment. I vowed to wait until the week of its release to finally do it. This is a dinosaur which became one of the most popular ever right next to Tyrannosaurus, thanks to the Jurassic Park franchise alone. Despite this, this dinosaur is extremely misunderstood by most people because of Jurassic Park's inaccurate portrayal of it at the exact same time. Let's get to know Velociraptor! Velociraptor mongoliensis family getting ready to sleep at dawn. Painting by Christopher DiPiazza. Velociraptor is actually known from a few species, but the most well known is called Velociaptor mongoliensis. The genus name, Velociraptor, translates to "Swift Thief" and the species name is in reference to Mongolia, where the dinosaur's fossils were originally discovered. Velociraptor lived during the late Cretaceous Period, between 80 and 71 million years ago. It was a meat-eater, and measured only a little over six feet long from snout to tail. The environment that Velociraptor lived in during the late Cretaceous would have been a desert, with hot days, cold nights, and little water nor food for animals. For these reasons, desert animals had to have some sort of evolutionary strategy that would allow them to survive, especially when it came to finding food. In the case of Velociraptor, paleontologists can tell that it would have had good vision under low light conditions, and likely was active either ad dusk or at night, thanks to the size of its eye sockets and width of its sclerotic rings Sclerotic Rings are thin, ring-shaped bones that are in the eyes of certain animals, including dinosaurs, that are used to support the eyes. The size and shape of these rings, when compared to those of animals today and what we know about their lifestyles, helps scientists guess how extinct dinosaurs would have been able to see in different lights. This would have helped it for a number of reasons. First of all, the temperatures aren't sweltering at night in the desert. In fact, deserts at night get quite cool. This means it would have been more comfortable for Velociraptor to have been active during these times. Second, some of the prey Velociraptor could have hunted may not have been as active at night, making it easier for the little predator to ambush. Owls, today frequently attack other birds (including large hawks!) in their sleep using this strategy. Velociraptor mongoliensis skull on display at the American Museum of Natural History in New York. It was an expedition by the AMNH during the 1920s, in fact, that yielded the first ever found remains of Velociraptor. In addition to good vision, Velociraptor had other adaptations that would have helped it hunt. Its snout was extremely long and narrow, and was filled with blade-like, serrated teeth for slicing meat. Its hands were each equipped with three long fingers, each tipped with a hooked claw, and its feet, like all members of its family, called dromaeosauridae, were each equipped with a retractable, crescent-shaped claw, on the second toe, for holding struggling prey in place. The tail of Veloceraptor was stiffened by bony rods inside it, called ossified tendons, and would have enabled it to have made sharper turns while running. Velociraptor skeleton on display at the Wyoming Dinosaur Center. Contrary to what you may see in popular media, Velociraptor was covered in feathers in life, just like a bird. Despite the fact that no actual feathers have been found attached to Velociraptor bones, themselves, (Feathers would have rotted away somewhere within the last 70 million years of the dinosaur being dead.) we do have strong evidence that they were there. A specimen of Velociraptor that was published in 2007 shows small, evenly spaced bumps on the dinosaur's, ulna. (forearm bone) The bumps, called quill knobs, are exactly the same as those found on the arm/wing bones of modern birds, which are the attachment sites for large primary(wing) feathers. Also, many specimens of dinosaurs closely related to Velociraptor that died in more favorable conditions for soft tissue preservation, do have feathers completely preserved right there in the fossil. Thanks to phylogenetic bracketing, it is safe to say that Velociraptor was definitely a feathered animal. Arrows pointing to quill knobs on a Velociraptor ulna. So why did Velociraptor have feathers, especially since it would have been too heavy to fly? Well, remember I said before it was likely active at night, when it is actually pretty cold in the desert. Feathers would have helped Velociraptor maintain a warm body temperature during those times. Today many nocturnal desert animals also have thick fur or feathers for insulation. Another reason for feathers could have been to help Velociraptor protect its eggs. We know that other theropod dinosaurs, like Citipati, used their arm feathers to protect their eggs from the elements, so Velociraptor could have been the same. 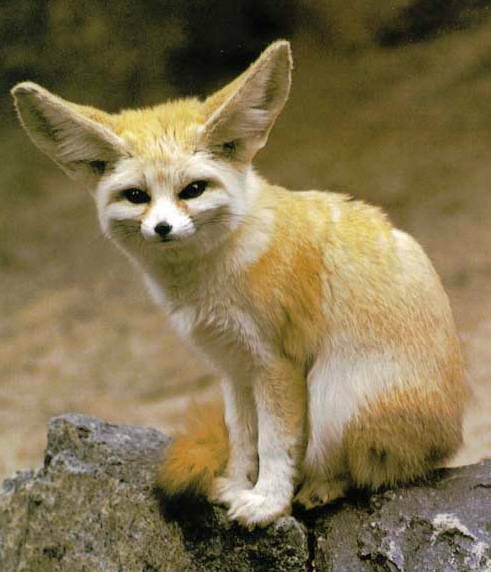 The Fennec Fox, native to deserts of Northern Africa, has a thick coat of fur to help keep it warm since it is most active at night, when temperatures in its habitat can drop quite low. Velociraptor may have had feathers for the same reason in it's desert habitat. Velociraptor was no doubt a predator when it was alive, but it probably wasn't as ruthless and terrifying (at least to a human) as popular media makes it out to have been. There is no evidence that suggests Velociraptor hunted in packs. (There is evidence for it in its larger relative, Deinonychus, however.) It is likely Velociraptor was good at hunting small prey, using its wicked retractable talon on each of its second toes to pin down prey so it could rip off pieces of meat with jaws. There is evidence that Velociraptor scavenged a lot of its meals too, like most meat-eaters will when given the chance, thanks to Velociraptor teeth marks found on the bones of Protoceratops, and even a large pterosaur. There is one spectacular fossil that shows us that at least sometimes Velociraptor did have run-ins with large prey. 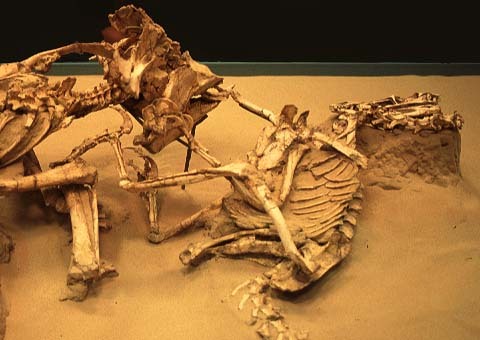 This fossil consists of a Protoceratops and Velociraptor together as they were most likely both killed by a sandstorm and buried immediately. The Velociraptor's foot, appears to be extended in the neck region of the Protoceratops. In turn, the Velociraptor's hand is firmly clamped in the ceratopsian's powerful beak. It is unlikely Velociraptor would have regularly attacked such a much-larger, and potentially dangerous animal, as Protoceratops. It is most likely that the plant-eater was sick or injured, and/or possibly even the Velociraptor was starving and desperate. The desert is a harsh place to live and starvation was probably an ever looming possibility for many animals. Other dinosaurs, in addition to Protoceratops, the ceratopsian, that would have shared this unforgiving habitat with Veloceraptor were the theropods, Oviraptor and Citipati. 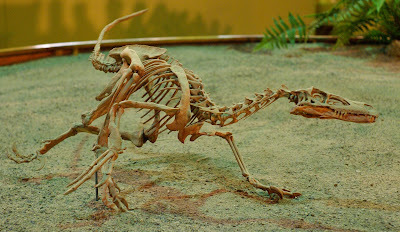 Dramatic "fighting dinosaurs" fossil featuring Protoceratops biting the hand of Velociraptor. That is all for this week! Hope you enjoyed getting to know the real Velociraptor! Please comment below or on our facebook page! Barsbold, Rinchen; Osmólska, Halszka (1999). "The skull of Velociraptor (Theropoda) from the Late Cretaceous of Mongolia". Acta Palaeontologica Polonica 44 (2): 189–219. Carpenter, Kenneth (1998). "Evidence of predatory behavior by theropod dinosaurs" (PDF). Gaia 15: 135–144. Hone, D.; Tsuihiji, T.; Watabe, M.; Tsogtbaatr, K. (2012). "Pterosaurs as a food source for small dromaeosaurs". Palaeogeography, Palaeoclimatology, Palaeoecology. 331-332: 27. Osborn, Henry F. (1924a). "Three new Theropoda, Protoceratops zone, central Mongolia". American Museum Novitates 144: 1–12. Schmitz, L.; Motani, R. (2011). "Nocturnality in Dinosaurs Inferred from Scleral Ring and Orbit Morphology". Science 332 (6030): 705–8. Turner, A.H.; Makovicky, P.J. ; Norell, M.A. (2007). "Feather quill knobs in the dinosaur Velociraptor". Science 317 (5845): 1721.